There is something about aliens that seems to ignite people’s imaginations. The mystery of whether there is intelligent life on other planets and if that life is trying to make contact with us has fueled decades of stories about UFOs, alien encounters, and alien sightings. While stories about aliens aren’t rare, being close to what is known as a hot spot for UFO buffs is. 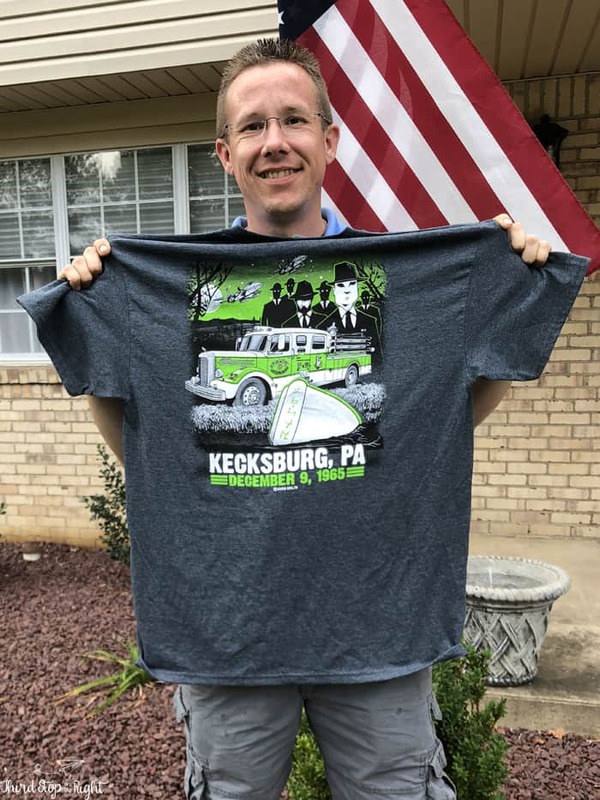 I am talking about Kecksburg, Pennsylvania. 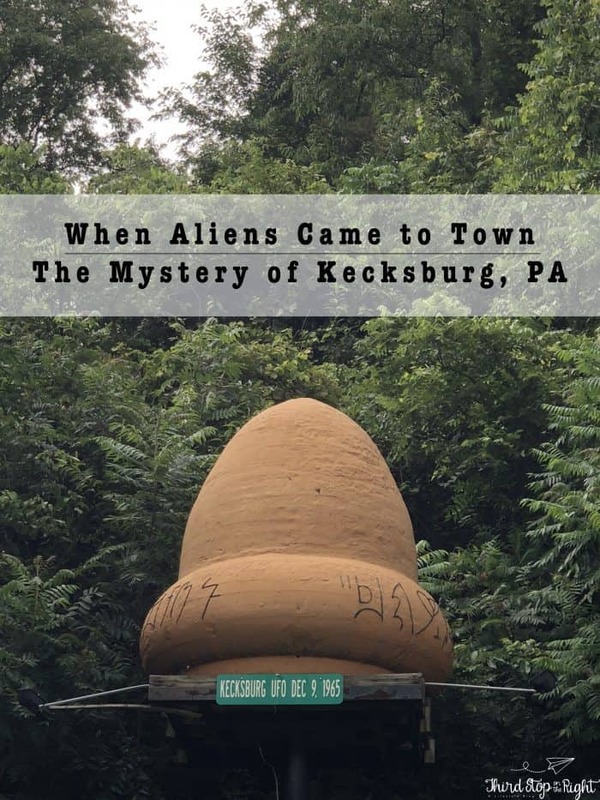 Located in a super-small town in Westmoreland County, about 40 minutes east of Pittsburgh, Kecksburg may have been the site of a crash of an extraterrestrial space craft more than 50 years ago. On the night of December 9, 1965 residents of Canada, Michigan, Ohio, and Pennsylvania witnessed what was described as a “fireball” streaking across the night sky. The object, which was about as large as a small car, crashed into the woods outside of Kecksburg. In fact, the object was so large and and so powerful that it registered on a seismograph all the way in Detroit, Michigan. Not knowing what had just happened, residents of Kecksburg contacted the state police who came and searched the woods. However, a few curious locals decided to have a look for themselves before the police got there. Eyewitnesses agree that whatever the object was that crashed into the woods was a bronze or gold-colored object and looked like an oversized acorn. There was a raised band around the bottom that looked to have some sort of writing that resembled Egyptian hieroglyphics. After the State Police searched the woods, the U.S. Government was called in. Members of the U.S. Army and Air Force showed up on the scene a few hours later armed with heavy equipment, including a flatbed trailer and a crane. The woods were quarantined off and declared “off limits”. Once the site was secured, residents who had gathered saw the flatbed truck removing the object (which had a tarp over it) from the site. Of course, the rumor mill and conspiracy theories started. What really crashed in the woods that night and why didn’t want the government want us to see it? Was it really an alien spacecraft? Most people felt that the object was a Russian space probe or satellite. In fact, the Kosmos-96 (a Soviet space probe) had failed and reentered the Earth’s atmosphere that same day, but the Russians claimed it had landed in Canada. To this day, no one really knows what crashed landed in the woods in Kecksburg. If it was just a meteorite, why was the government so concerned? If it was something man-made wouldn’t the classified status be over by now? 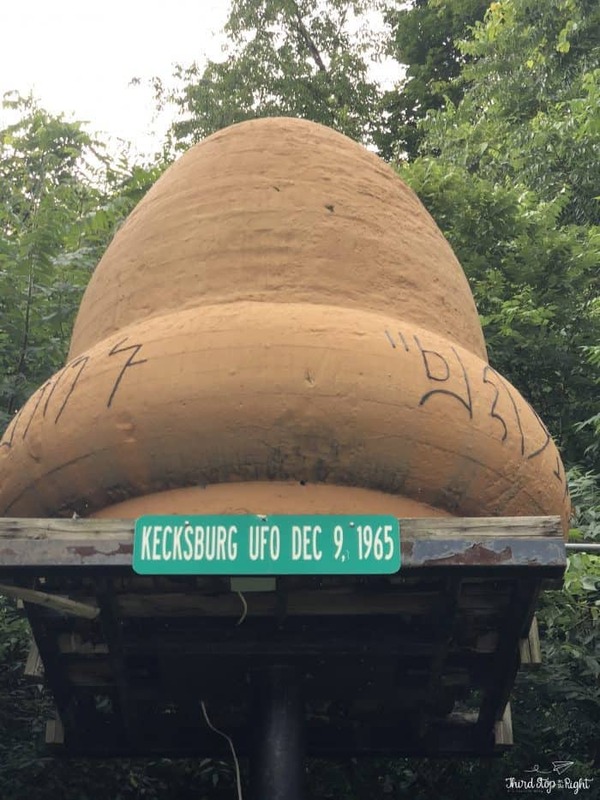 Although we might never know the story of the Kecksburg UFO, there is a fun monument to this event outside of the Kecksburg Volunteer Fire Department. It is actually a prop for a 1990 Unsolved Mysteries episode, but it is now displayed on a lighted display to remember what happened that December night. While you are there, be sure to stop by the fireman’s club and Kecksburg UFO gift shop. They have some really cool Rosewell/Area 51 style t-shirts. Not only are these shirts cool, but they also benefit the fire department so it goes to a good cause. If you are visiting the area near the end of July, you might be lucky and catch the UFO Festival. With food, crafts, speakers, and fireworks it is a good time. Plus, it also benefits the fire department.